Normally Rules Committee is just for scheduling Council business, but it also handles budget ordinances. Chair Richardson and I have been working on these bills over the last few months. 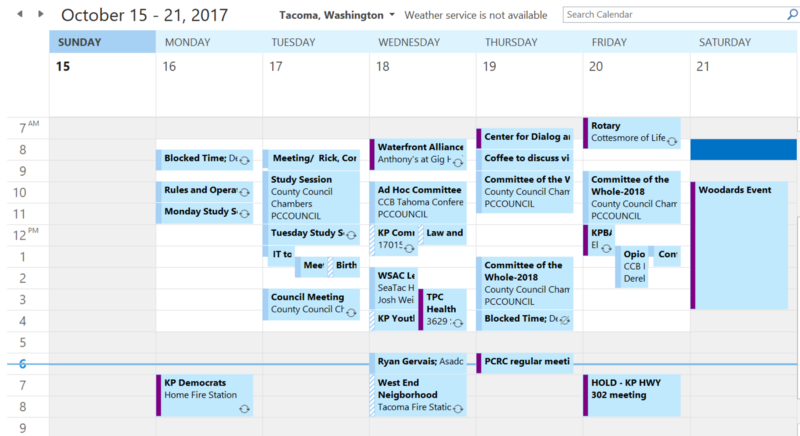 Proposal №2017–51, County Excise Tax on Real Estate Sales and REET Adjustments An Ordinance of the Pierce County Council Amending Chapter 4.24 of the Pierce County Code (PCC), “County Excise Tax on Real Estate Sales”; Eliminating the Current Allocation Formula for the First .25 of 1 Percent Real Estate Excise Tax by Repealing PCC 4.24.060, “Distribution and Disposition of Proceeds of Tax Imposed Under PCC 4.24.010”; Repealing the Sunset Date of the Second .25 of 1 percent Real Estate Excise Tax; and Setting an Effective Date. Real Estate Excise Tax provides local government with the bulk of its capital tax dollars. 1st REET, is the most flexible of the two REET taxes collected. Unlike almost any other county, Pierce has dedicated portions of REET to pay for specific programs. Particularly to pay for flood control on the Puyallup River. What drives me a little bananas is that we now direct most of our surface water fees and Flood Control Zone District tax collars to the same purpose. Meanwhile, County facilities are crumbling, parks lay undeveloped or in disrepair. It’s time that we put that revenue back to work for the whole county. To be clear, this wouldn’t redirect REET to any other purpose. Instead, it would go through normal budget process for appropriation competing with other priorities. Proposal №2017–55, Interfund Loans An Ordinance of the Pierce County Council Adopting a New Chapter 2.130 of the Pierce County Code, “Interfund Loans,” Creating Policies and Procedures For the Approval and Use of Interfund Loans. This is another bill that comes out of our Budget Ad Hoc Committee this year. When I arrived to the Council I was amazed to find a large number of intrafund loans with seemingly no terms or rules to justify them. The Equipment Rental & Revolving Fund seemed to act a bit like the Council’s piggy bank. The new policy would establish maximum terms to stay consistent with the State Auditor’s guidance, and a rate that is both cheaper than the debt market, but higher than the state investment pool. That should mean there’s benefit to both the borrowing and lending fund. Public hearing on Ordinance №2017–58, which was passed by the Pierce County Council on September 19, 2017: Ordinance №2017–58, An Emergency Ordinance of the Pierce County Council Adopting Development Moratoria Pursuant to Revised Code of Washington (RCW) 90.58.590; Prohibiting Disposal of Dredged Material within the Nisqually Reach Aquatic Reserve; Providing Notification to State Agencies; Adopting Findings of Fact; Setting a Date for Public Hearing; and Declaring an Emergency. Last month we declared an emergency moratorium to prohibit the disposal of dredge material within the Nisqually Reach Aquatic Reserve off Anderson Island. State law requires a public hearing to be held within 30 days of the passage of moratorium to allow for comment. I’m not sure what will specifically be discussed, but this is a high interest issue for the Council, Executive, and our partners at the City of Tacoma. This meeting will be broadcast live and replayed on channel 22 (Comcast and Click! Network) and replayed on channel 78 (Rainier Connect). Electronic meeting material can be accessed at www.co.pierce.wa.us/index.aspx?nid=1438. Video archives are available at www.piercecountytv.org. We use Committee of the Whole (COWs) for our budget hearings. Each COW is an opportunity for the departments to justify their requests and respond to Council questions. Worth noting that I will miss the first COW as I have a County Association Legislative Steering Committee meeting. All of the Budget COWs have the same information from above so I won’t repeat them for each meeting.